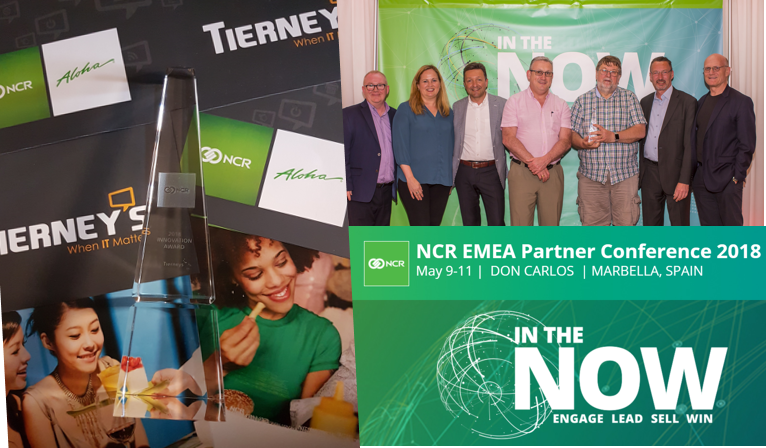 The team in Tierney’s are proud to announce their latest achievement which was announced at the Annual NCR Corporation EMEA Partner Conference held in Marbella, Spain earlier this month. We won the Award for Innovation across the three sectors of NCR Business (Finance/ Hospitality/ Retail) across the regions- Europe, Asia and Africa. “Innovation can come from a number of aspects, but Tierney’s have shown fantastic initiative and innovation with regards to their re-branding and re-imagination as an NCR Aloha partner. New branding and new marketing initiatives have really led the way for some great sales achievements” Richard Goodall – VP, EIMEA Hospitality, NCR Corporation. NCR Corporation is a global leading technology and omni-channel solutions company and Tierney’s are proud to be the sales, installation, training and support partner for their NCR Aloha Restaurant Hospitality Point of Sale Solutions. The partnership has grown from strength to strength over our 10 year association. We have customers using NCR Aloha Quick Service and Table Service Restaurants Solutions on fixed POS terminals and built for purpose Handheld devices NCR Orderman. NCR Aloha is a world leader in restaurant POS technology, and is used in over 130,000 restaurant’s sites worldwide. MD Andy Tierney and Business Development Manager John Hehir were in Spain to receive the award at The NCR EMEA Interact Partner Conference. ”We are very proud of our achievements with NCR and this award came as huge delight for our small but hard-working POS team within Tierney’s. Our Aloha customers are continually growing across Ireland and the UK and we appreciate the continued support that NCR gives to their partners, enabling us to successfully and profitably deliver their products and solutions to our customers’’. Andy Tierney, MD Tierney’s Office Automation Ltd.